The last time John Edward came to Portland, I wanted to go. I’d read some of his books, taken some of his free online classes, and watched his TV show, Evolve. I couldn’t wait to see him in person! Alas, was unable to find anyone to go with, so I stayed home. This year when I saw he was coming again, I still wanted to go. I figured that if one year later I was still dying to see him, I had to go. The story was the same, though. I couldn’t find anyone to go with me. I also had family commitments that precluded me from going. At the eleventh hour, the planets aligned and my schedule opened up. I decided to be brave and go by myself. I even got a big discount on my ticket! It was so worth going. I loved every minute of this show. 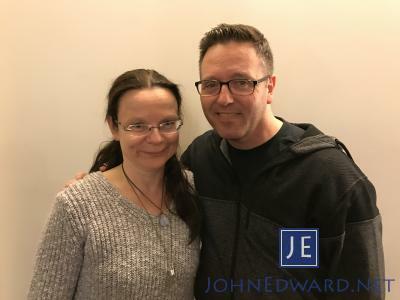 I didn’t get a reading myself, but what John said at the outset was true: if you get a reading, you wind up missing a lot of what happens after. I was there to learn, and I did learn. A lot. Plus, John and his announcer/friend Katrina are funny! And warm! And caring! Everything you want in a human being. John’s spirit messages for the families that did receive readings were incredibly accurate. He doesn’t let people bully him (and surprisingly, someone did try to) into making his information fit their story. He insists on accuracy and validation and it makes a huge difference in the quality of the readings. If John ever comes back to my area, I am so going again. Even if it’s by myself.